When a child knows a thing, he automatically assumes everyone else does. This false belief is demonstrated by the famous Sally-Anne test, in which a child watches an object get moved from its original place, then is asked where someone who hasn't seen this move will guess where the object currently is. Children under 4 generally predict wrong, because they're not yet aware of separate consciousnesses other than their own. 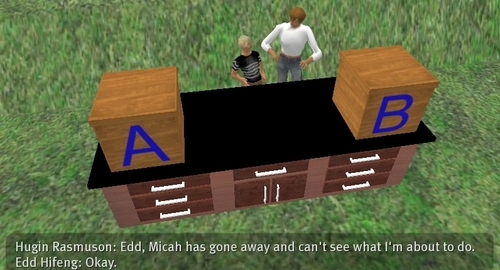 According to this an announcement from the Rensselaer Polytechnic Institute, researchers with the school have been able to simulate this phenomenon with an AI in Second Life, using "an automated theorem prover coupled with procedures for converting conversational English in Second Life into formal logic". Wonder if they've seen similar self-awareness in their SL-powered bots. In fact, I think I'll ask.